Illinois Appellate Judge Mary Mikva (right) presented Jack Etchingham '20 with the 2018 Ilana Diamond Rovner Award for Outstanding Appellate Advocate. 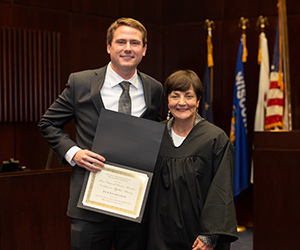 Jack Etchingham, a second-year student at Chicago-Kent College of Law at Illinois Tech, has won the 27th annual Ilana Diamond Rovner Appellate Advocacy Competition, sponsored by the law school's Moot Court Honor Society. The competition is named for Chicago-Kent graduate Ilana Diamond Rovner, judge of the U.S. Court of Appeals for the Seventh Circuit. This year, students argued Gamble v. United States, a case involving a convicted felon who was charged by both state and federal officials with possession of a firearm by a felon after police found a handgun in his car during a 2015 traffic stop. 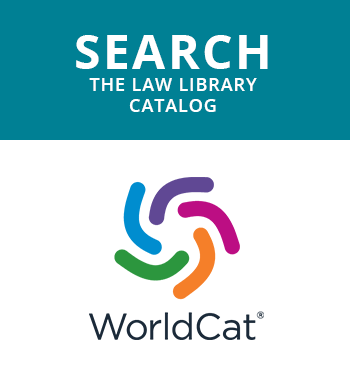 At issue is whether the U.S. Supreme Court should overrule the separate-sovereigns exception to the Fifth Amendment’s Double Jeopardy Clause, which allows a defendant to be prosecuted under state and federal law for the same underlying crime. In the final round of competition, Jack Etchingham argued against Alec Kraus ’20. As first-place winner, Etchingham received the Ilana Diamond Rovner Award for Outstanding Appellate Advocate. 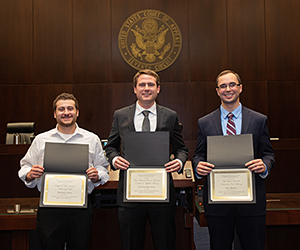 From left: Mitchell Bild '20 won the Ralph L. Brill Award for Best Brief; Jack Etchingham '20 won the Ilana Diamond Rovner Award for Outstanding Appellate Advocate; and Alec Kraus '20 won the Fay Clayton Award for Outstanding Oral Advocate. 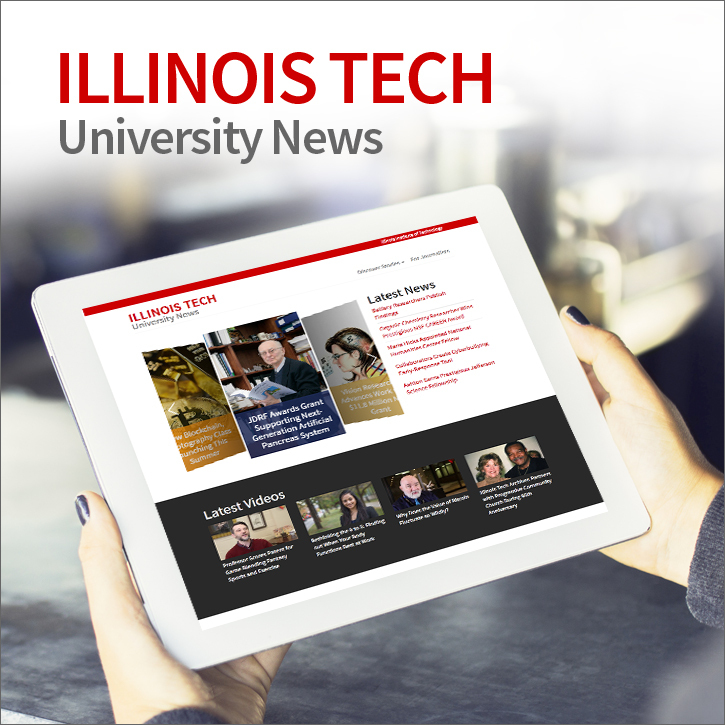 Etchingham graduated from the University of Illinois at Urbana-Champaign with a degree in finance and spent three years before law school working as a technology risk consultant at KPMG LLP in Chicago. He clerked in the Medical Litigation Department of the Cook County State's Attorney's Office last summer. Etchingham is currently a judicial extern for the U.S. District Court for the Northern District of Illinois through the law school's Judicial Externship Program. 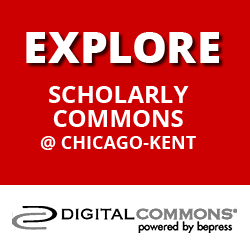 Additionally, he is a member of the Chicago-Kent Law Review and a teaching assistant for a first-year Torts class. Alec Kraus, who placed second, won the Fay Clayton Award for Outstanding Oral Advocate. 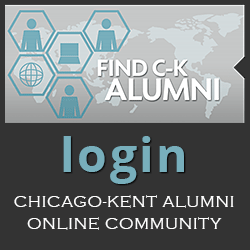 Ms. Clayton, who graduated with honors from Chicago-Kent in 1978, was a founding shareholder of the Chicago law firm of Robinson, Curley and Clayton, P.C., until she retired in 2016. Second-year student Mitchell Bild received the Ralph L. Brill Award for Best Brief. Professor Ralph Brill, who taught at Chicago-Kent from 1961 through late 2016, founded the law school's legal research and writing program and its award-winning moot court program. The final round of the competition was judged by a distinguished panel that included the Honorable Ilana Diamond Rovner; the Honorable Mary L. Mikva of the Illinois Appellate Court, First District; and Chicago-Kent Dean Harold J. Krent. Established in 1992, the Ilana Diamond Rovner Program in Appellate Advocacy provides training for students in Chicago-Kent's Moot Court Honor Society. Students in the program complete intensive course work in appellate litigation, represent the law school in appellate advocacy tournaments throughout the United States, and are eligible to participate in the Ilana Diamond Rovner Competition.